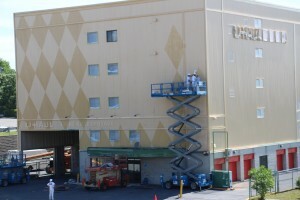 FinDecor has now been offering commercial painting services for the past 15 years. We did painting mandates for hundreds of institutions, commercial buildings, and industries of all kinds in different areas of Montreal and hereabouts: Laval, Longueil, Beloeil, Québec city, etc. Our construction painters painted hospitals, cathedrals, schools, Université de Montréal buildings, hotels, several daycare centers, many commercial units, restaurants, large warehouses, storage units, small offices, big stores and small shops, and thousands of houses and condominiums. If you live in Montreal, it is most certain that we already painted a commercial or residential building in your neighbourhood, and you probably already passed by us at one time or another. To better look after your needs, we offer you to work outside your office hours: we do night shifts, and we even work on weekends! We adapt to your schedule, whatever it is, and we always respect your calendar. Moreover, we always protect properly your floor and all objects that need not be painted. Our painters also leave your rooms and building clean. As required by law, we do have an accident insurance that covers up to $12,000.00 in damage so you can sleep tight. Our painters are all CCQ certified and our company has been accredited by the RBQ. Our painters are reliable and punctual professionals, and our service is faultless. Contact me now for a free estimate!